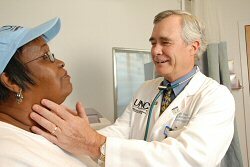 What is the UNC Health Registry/Cancer Survivorship Cohort (HR/CSC)? We asked patients who had an appointment in the North Carolina Hospital system to think about being part of this historic scientific effort. The goal of the HR/CSC was to better understand the causes of diseases, like cancer, which affect many North Carolinians. We enrolled over 7,500 North Carolinians in the Registry. This website is designed to explain what it meant to enroll as a participant in the UNC Health Registry/Cancer Survivorship Cohort. The purpose of this research was to collect information and biologic specimens that will be collected and stored together for use in different kinds of research; this is called a specimen "biobank." The purpose of this biobank is to serve as a resource for future research. Researchers use specimens and data from participants to study how genes, lifestyle and our environment may lead to disease and to study what things may affect how people do after they are treated. What happened if participants took part in this research? Agree to allow researchers to contact you in the future to invite you to take part in other research studies. What were the Risks of Participation? There were minimal risks to participating in this research. There was a slight chance of minor bruising or fainting associated with obtaining the blood specimen however this risk was minimized as blood was drawn by trained and skilled phlebotomists. There was a small risk of breach of confidentiality. However, all research staff were instructed to keep data in strict confidence and information related to this research was stored under conditions designed to protect the privacy of research participants. The link between participants' identifying and research information was kept secure. Some of the questionnaire items were of a personal nature and may have made participants uncomfortable. Participants were allowed skip any questions that they do not want to answer. Research was designed to benefit society by gaining new knowledge. The information provided will help researchers better understand the causes, treatments and prevention of disease, as well as ways to improve health care and quality of life. Future generations may benefit from the results and knowledge gained from this research – maybe even for your own children or your neighbors’ children.